Museum in Stuttgart, Germany. Costume was designed in the 1920's. at Metropol theater in Berlin, 1926. 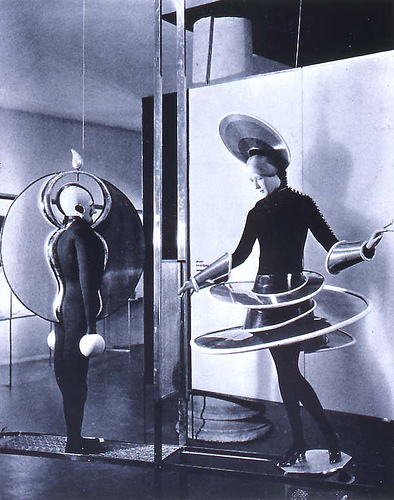 Triadisches Ballett (Triadic Ballet) is a ballet developed by Oskar Schlemmer. It premiered in Stuttgart, on 30 September 1922, with music composed by Paul Hindemith, after formative performances dating back to 1916, with the performers Elsa Hotzel and Albert Berger. 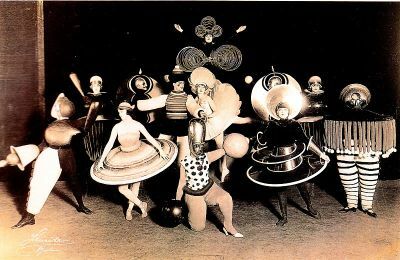 The ballet became the most widely performed avant-garde artistic dance and while Schlemmer was at the Bauhaus from 1921 to 1929, the ballet toured, helping to spread the ethos of the Bauhaus. He saw the movement of puppets and marionettes as aesthetically superior to that of humans, as it emphasised that the medium of every art is artificial. This artifice could be expressed through stylised movements and the abstraction of the human body. His consideration of the human form (the abstract geometry of the body e.g. a cylinder for the neck, a circle for head and eyes) led to the all important costume design, to create what he called his ‘figurine'. The music followed and finally the dance movements were decided. Schlemmer saw the modern world driven by two main currents, the mechanised (man as machine and the body as a mechanism) and the primordial impulses (the depths of creative urges). He claimed that the choreographed geometry of dance offered a synthesis, the Dionysian and emotional origins of dance, becomes strict and Apollonian in its final form. Schlemmer's 'figurines' were also shown at a 1930 exhibition at the Societe des Arts Decoratif in Paris, and again in 1938 at the Museum of Modern Art's Bauhaus exhibition in New York. The figurines were exhibited in stasis, without their choreography. Much later, Schlemmer's figurines appeared in the V & A's 2006 Modernism exhibition accompanied by video recordings of their movement. 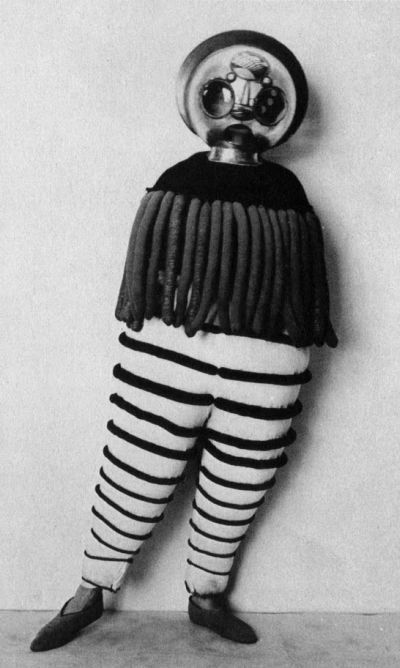 Some of Schlemmer's original costumes were preserved and can be seen at the Neue Staatsgalerie in Stuttgart, Germany.